The Great South West track has got to be Victoria’s best kept secret – a 250km continuous loop of untouched environment, from dramatic isolated coast with massive limestone cliffs and pristine beaches, to meandering rivers and remote bushland teaming with wildlife. Aboriginal heritage sites, the mighty Southern Ocean and freshwater lakes make this one of the most varied walks in Australia. This walk is a “Symphony in Four Movements”, depicted beautifully in this video. The first stage of the Great South West Walk is the Cobboboonee Forest containing the headwaters of the Surry and Fitzroy Rivers. Here kangaroos are visible bounding across the track with the loud calls of red-tailed black cockatoos in the background. Next is the picturesque Glenelg River, which stretches out as it nears the coast then carves its way through a spectacular limestone gorge. Onto the pristine sandy beaches, rocky outcrops and freshwater lakes of Discovery Bay Coastal Park. The grand finale is the Three Capes and Bays section where the track hugs the clifftop all the way. These rugged, wave-bashed headlands are the highest in Victoria and are perfect for whale spotting in season. The colony of Australian fur seals at Cape Bridgewater is there year-round, so they can’t be missed. The variety of habitats makes this a great place to see all the iconic creatures like kangaroos, echidnas, koalas and emus range freely. The full Great South West Walk option is a “walker’s walk” and a real challenge. This is why we also offer the Great South West Walk Highlights, a challenge in itself, but with the added advantage of experiencing the combined variety of this walk in a more manageable 8 days. Start in Portland any time after 2pm. There is no walking scheduled for today, but you can easily enjoy exploring the old buildings, walking along the beach or visiting the excellent Maritime Discovery Centre. The 250km circuit commences in Portland at the Portland Lighthouse and coastal cliffs before heading inland across farmland then into the bush. Note: As accommodation is limited on this remote track, you will be picked up at the end of the day’s walking and transferred back to your stay for the night. The following morning you will be returned to where you finished walking the day before. A bush day today in the recently proclaimed Cobboboonee National Park. Wildlife abounds, with kangaroos hopping across the track, echidnas digging for ants, goannas climbing trees and numerous parrots flocking about. Another day through the Cobboboonee National Park is highlighted by the Inkpot and pretty Moleside Creek. You’ll be met here at the end of the day and taken on to new accommodation at Nelson. Today you’ll begin the picturesque Glenelg River section, hiking from Moleside Creek to Sapling Creek. The track is close to the river most of the way giving rise to delightful opportunities to take a swim. A real highlight today is when you progress through the Glenelg River Gorge and continue to follow the river all the way into the settlement of Nelson. The character of the river changes dramatically as it makes its way through the gorge. The river then widens as it nears the coast and you’ll start to see boat sheds that have been converted into waterfront holiday houses. Spend the morning following the sandy beach of Discovery Bay, before heading inland, parallel to the coast, to emerge at a huge freshwater lake in the afternoon. Spend some of the day at the beach and hike from Lake Mombeong to Swan Lake, another large freshwater lake. These lakes are a delightful place for a refreshing dip at the end of the day. After the morning on the beach, you’ll leave the sand behind and tackle the only hill on this walk, Mount Richmond. The summit area has magnificent wildflower displays and a colony of koalas. For the afternoon, the track heads inland parallel to the coast, to emerge at Bridgewater lakes. Begin the Three Capes Section of track. Highlights include the Blowholes, the Petrified Forest and a seal colony. The track hugs the cliff the entire way with ample photo opportunities. Walk right up to your accommodation at Bridgewater Bay. 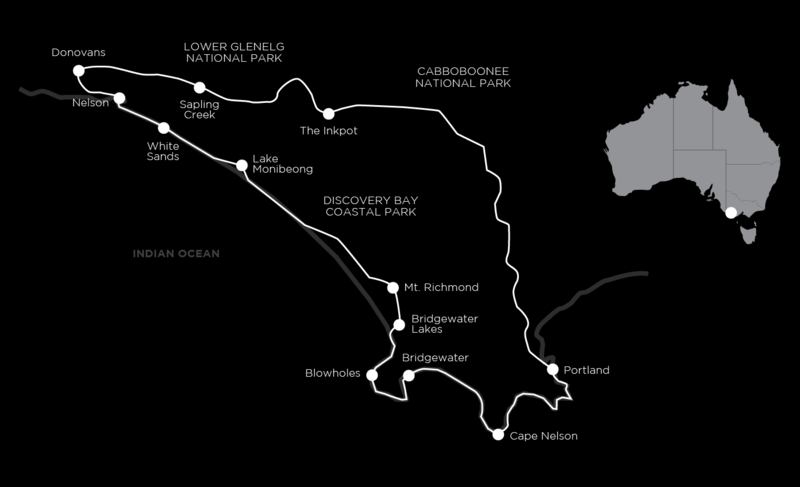 From Bridgewater Bay, the route continues via the beach, then clifftop track to Cape Nelson Lighthouse. The cliffs here are higher than anywhere else in Victoria which makes for excellent hiking. There’s a cafe here to reward yourself at the end of the hike. Continue from Cape Nelson all the way into Portland. Highlights include Yellow Rock, Cape Sir William Grant, a colony of endangered Australasian gannets and the Portland Battery. Then it’s back to the B&B in Portland where you can boast about your achievements. The track is well graded and relatively easy to negotiate except on small portions of the track in Cobboboonee, which are still easily passable. Full days walks average about 22km. This walk is a great opportunity for fit walkers to challenge themselves. This supported hike has you walk in and out of remote tiny hamlets and staying at small bed and breakfasts and lodges. Your hosts Denis, John, Trish and Roger have been part of our team for nearly twenty years and love accommodating and feeding our walkers. The rooms all have ensuites except at Nelson Lodge. Nelson Lodge was an old police station and has real character and it is most likely that you will have the place to yourself. The views from Sea View Lodge at Bridgewater make you feel like you never left the track. On some of the days’ walks, you are literally walking in and out of accommodations. The food is prepared by your hosts and the local restaurant at Bridgewater where the food is prepared by a chef. Each day whilst you’re walking you’ll be provided with a substantial Walkers Lunch and get to eat it at a fabulous location on the track. A Walkers Lunch is varied and may include a high protein type salad, roll or a wrap, muesli bar, cake or muffin and a piece of fruit. This trip starts and finishes in Portland, which is a 5-hour drive from Melbourne. If you prefer, you can fly to Portland from either Melbourne or Adelaide. There are also public transport services from Melbourne. Contact us for more details. We have rated this walk as moderate as some days are quite long. Full day walks average about 22km, 5 to 7.5 hours walking each day. The walking is mostly flat over reasonably well-walked paths, bush tracks and with some sandy sections. This is a great opportunity for fit walkers to rack up some long distances. This walk can be done any time of the year except for the winter months of June, July and August. September to April is the ultimate time of the year for walking. Sea breezes usually keep the temperatures comfortable in summer, although there can be a period of quite hot weather, especially during February. Warning about tide times – we may have to a little flexible with your start date to make sure that the walking on the beach at high tide is avoided. This walking holiday includes some sections of beach walking, so you need to take into account the tide times when choosing a starting date. To check tide charts, go to the Bureau of Meteorology and select your location as Portland. We can assist you if you need help understanding the charts.